Delicious mix of raspberry and dark chocolate with oatmeal crumble protein bars. High fiber, high protein and super easy! Recipe: 1 can low sodium chickpeas drained and rinsed, 3/4 cup gluten free oats, 3 egg whites, 1 Tbsp cinnamon, 1 tsp vanilla extract, 2 scoops vanilla protein power ( I used trutein) 1/2 tsp baking powder, 1/2 tsp baking soda, 2 tbsp agave nectar or honey, 1/2 cup unsweetened apple sauce, 2 heaping Tbsp non fat plain Greek yogurt. Blend in a food processor until smooth. Pour into greased 13 x 9 baking dish and dallop no sugar added raspberry jam ( I used Crofters!) over the top. Swirl in jam with a knife. Crumble topping: 2 cups gluten free oats, 1/4 cup melted coconut oil, 1 tbsp cinnamon, 2 tbsp agave nectar or honey. 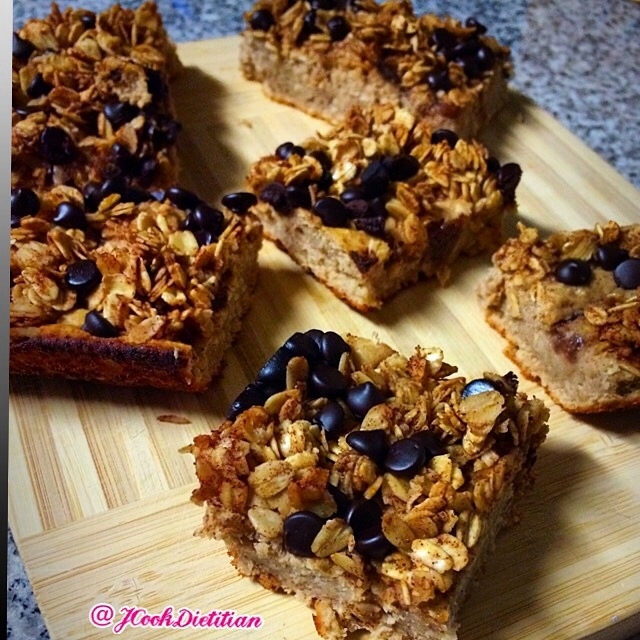 Place crumble topping onto dough and then top with Lilly's stevia sweetened dark chocolate chips about 1/3 cup! Bake at 350 degrees for 25 minutes. Cool and then cut into squares! This recipe makes about 16-20 squares depending on how big you slice it! Enjoy!